Go down the Rabbit Hole for the magical ride to the City of Vallejo and be enchanted by the wonder! “I'm not strange, weird, off, nor crazy, my reality is just different from yours,” Cheshire Cat. VALLEJO, CA, October 03, 2018 — If you've missed the Burning Man Festival or Maker's Faire or want more of that creative outpouring then the Mad Hatter Holiday Festival is it! A reconceptualized Wonderland in the historic district of Vallejo with mutant vehicles, electrifying lighted floats, fire shooting Dinosaurs and wandering prehistoric robotic creatures as the Rhino Redemption and Mechanical Giant Squid make their way through Wonderland's Jurassic Park. 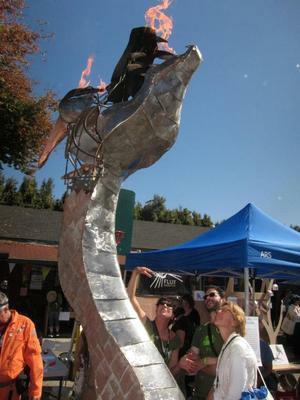 Every year there are acclaimed and roving mutant contraptions, many created for the annual Burning Man Festival that make their way to Vallejo for the Mad Hatter Holiday Festival. This year there will be the Airpusher (Grand Victorian Air Ship) Landau the Dragon and Mechateuthis (giant mechanical squid). At the center of the Festival will be the visiting SOMA structure (an interactive lighted stainless steel sculpture created by the Flaming Lotus Girls). Other Wonderland visitors expected at the Festival are the many unique roving creations of Obtainium Works, Vallejo's own Steampunk compound. There will also be Star War characters, the Mad Hatter's Tea Party favorites, plus a guest appearance of a mutant recreation of Nausicaa of the 'Valley of the Wind” from the popular Japanese animated movie. This year's Grand Marshal is Pati Navalta Poblete, founder of the Robby Poblete Foundation that transforms unwanted firearms into weapons of hope and opportunity through art and vocational skills programs and ARC-Solano, serving people with developmental disabilities and their families. Steampunk societies from the Bay Area and Sacramento fill the streets in their Victorian or Edwardian attire and this year creatively designed lighted floats from the City of Rancho Cordova premier their unique creations from Sacramento's popular Holiday Light Parade that takes place the week after the Mad Hater Holiday Festival. The Mad Hatter Holiday Festival & Tree Lighting is held on Saturday, December 1, 2018, downtown merchants are engaged during the festival with interactive ongoing celebrations, a live holiday jazz performance will be at the Empress Theater, popular food trucks line the streets, hot chocolate, coffee, and tasty foods from all cultures will be available. There will be many family and children activities from the Holiday Train in Wonderland, a toddler's Carousel, bouncy houses, bungee jumping, a bull ride plus a hands-on-opportunity to control the robotic prehistoric creations. The Mad Hatter Flash Mob will pop-up unannounced at the Festival, expect the dancing Mexican horses, Harry Potter's Night Bus, a space mobile, roving cup cakes and forest trees, as well as the Admiral's Pirate Ship, award winning flying gymnastics and lighted Hula Hooper performers, along with our top billing Santa! There are also several food courts and a Mad Hatter Beer & Wine Pub with live bluegrass musicians near the Tree Lighting Ceremony, a firing 5 foot Gee-Nome and a live reptile display along with the Giant Squid, roaming R2D2 Droids and Darth Vader leading the Storm Troopers. After the tree lighting by Vallejo's beautiful Waterfront is the Vallejo's Yacht Club's Lighted Boat Parade.